When I read the first chapters of William Ritter’s young adult fantasy novel „Jackaby“ almost two years ago I soon realized that this was about to become a new favorite series of mine. I’ve always been a sucker for historical crime fiction especially when it’s set in the late 19th century and if you also give me a weird detective that feels like a quirky character played by Johnny Depp and taken from a witty Tim Burton movie (seriously, can someone please persuade those two into adapting the book series for the big screen?) then you can be almost 100% sure that I would love it – and Mr. R.F. Jackaby, the detective with a special focus on investigating unexplained phenomena, is only one part of a cast of amazing characters that turn these books into a hell of a lot of fun. Just as much as Sherlock Holmes wouldn’t be the same without his congenial and loyal colleague Dr. John Watson, Jackaby needs a partner that he can rely on – and who is able to bring him to reason when he’s at risk of getting lost in the chaos that is both in his head and in his office: Abigail Rook, an adventurous young woman who left her family in Great Britain behind and came to New England to follow in her father’s footsteps and become an explorer – and eventually ended up with the quirky detective. Who killed Jackaby’s ghostly landlady? While I already had plenty of fun reading „Jackaby“ and the sequel „Beastly Bones“ and loved both the setting and the great characters I still had the feeling that something was missing, something that would take the series to the next level and make it more than „just“ a highly entertaining crime series for young readers – and apparently William Ritter has been able to read my mind because „Ghostly Echoes“, the third installment in the Jackaby series, is exactly the book I’ve been wishing for. If we go back to the second book in this series we remember that the main case got solved but that it still left us hanging in the air with quite a few unanswered questions, questions that mostly involved Jenny Cavanaugh, the ghostly landlady of 926 Augur Lane where Jackaby runs his unusual detective business. As we all know, Jenny’s life has found a very unpleasant ending years ago but the case of her murder has never been solved (yet) and is still a very sensitive topic that upsets the ghost every time it’s brought up – but Abigail is now determined to finally solve this cold case and give Jenny closure so that she might be able to move on and no longer has to live as a prisoner in her own home that is bound to that place by the terrors of her past. „Ghostly Echoes“ therefore almost exactly picks up where „Beastly Bones“ ended and it soon becomes clear that this third book will be by far the darkest one in this series. We see Jenny Cavanaugh suffering from serious mental attacks and we experience New Fiddleham not just as a vivid town with fantastical creatures (the way Jackaby likes to see it as he explains to Abigail in one of my favorite scenes in this book while strolling through the streets) but also as a place where dark and violent things lurk in the shadows and where evil forces pull the strings behind the scenes. I really loved this new atmosphere because it felt as if the series has been growing up since the first book and is no longer just the amusing young adult story but a serious piece of crime fiction. Yes, there’s still the hilarious bantering going on between Jackaby and Abigail but many of the entertaining dialogues had to make way for conversations with more depth and sincerity since the stakes are much higher in this new case and our beloved characters are in some serious danger. But it’s not just the darker atmosphere and the hazardous investigation that make the Jackaby series take the next step, it’s also the character development that gives „Ghostly Echoes“ more complexity than the first two books. R.F. Jackaby still remains a mysterious person (which is good, because otherwise the character might lose a lot of its fascination), but William Ritter gives us more insights into the detective’s past and into what made him become the person that he is now and this is where you will realize that Jackaby is way more than just a weird man with odd clothes and strange beliefs. 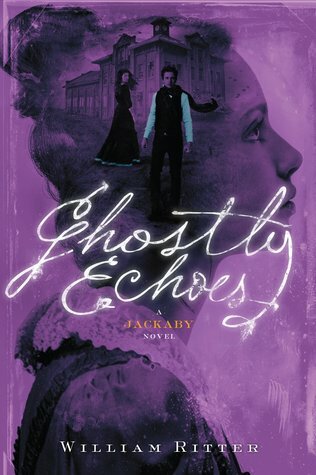 „Ghostly Echoes“ also lets Jenny Cavanaugh evolve from being a filler character and some nice decoration for Jackaby’s house in Augur Lane and gives her not only more attention but also an interesting background story that comes with more depth for her character. And despite a bigger focus on Jackaby and Jenny there’s still enough room for Abigail to play an important role in this story as well and to show that she’s more than just a simple assistant that does the filing for her employer. Ritter does a great job at giving every character the attention that it deserves and „Ghostly Echoes“ even provides a little unexpected reunion that will have fans of this series beam with joy. For all those reasons mentioned above „Ghostly Echoes“ easily became my favorite book in this series. Don’t get me wrong, I already loved „Jackaby“ and „Beastly Bones“ but this third book gave me this special something that I’ve still been waiting for and took the series to the next level by becoming darker and more mature and giving the characters and the whole universe that William Ritter has created more depth. There’s still room for improvement by maybe giving the story some more twists and even more suspense and working on the relationship between Jackaby and Abigail (and I don’t even mean in a romantic way) but seeing the latest development of this series felt very satisfying for me because Ritter definitely keeps steering it in the right direction. 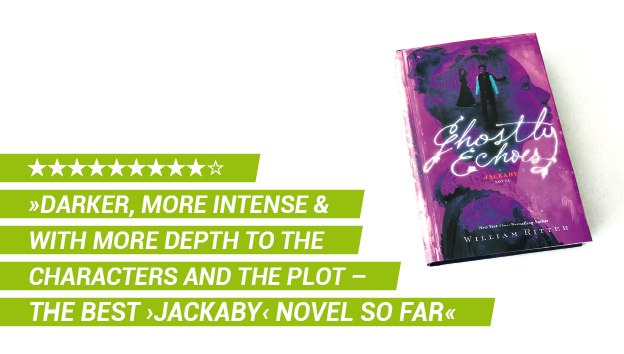 If you’re already a fan of the quirky detective and his witty partner then there’s no way you’re not going to like this book and if you’re not than „Ghostly Echoes“ is another proof that you’re missing out on a really great fantasy mystery book series. With his third Jackaby novel „Ghostly Echoes“ author William Ritter takes his entertaining fantasy mystery series to the next level and enters a much darker chapter that not only adds a lot more depth to the characters but also provides a more complex and gripping story than before that comes with a very intense atmosphere. Ooh, I like that movie idea! I think I’ve completely forgotten what happens in this book. /o\ We might need a reread before the last book. habe mal vorsorglich nicht alles gelesen, sondern nur den letzten Absatz und das Fazit. Aber schon die Bewertungszahl löst Begeisterung aus. Die Cover sind ja alle irre cool! Und man o man, jetzt muss ich noch bis nächstes Jahr Herbst auf Teil zwei warten. So ist das, wenn man unbedingt die deutsche Übersetzung lesen will. >.< Meh.